Alcatel One Touch Pop 3 5.0 Ca.. Specially designed for Alcatel One Touch Pop3 5.0 inch Smartphone Folio Style: 3 card slots and inner pocket for ID, cash, and credit cards, it can be used as wallet to keep card and money Built-in stand feature for viewing media,it is can adjustable viewing angles,This is a very practical Made of synthetic material leather,Magnetic closure,Unique design allows easy access to all buttons, controls & ports without having to remove the case Slip your Cell in to add a splash of colour and Anti-dust, Impact protective and tear-resistant Feature: Specially designed for Alcatel One Touch Pop3 5.0 inch SmartphoneFolio Style: 3 card slots and inner pocket for ID, cash, and credit cards, it can be used as wallet to keep card and moneyBuilt-in stand feature for viewing media,it is can adjustable viewing angles,This is a very practicalMade of synthetic material leather,Magnetic closure,Unique design allows easy access to all buttons, controls & ports without having to remove the caseSlip your Cell in to add a splash of colour and Anti-dust, Impact protective and tear-resistant Package included: 1*Wallet Case About us: We are Manufacturer, not Retailer! Our tenet is: provide you the highest quality product with reasonable price, In order to keep up with all other sellers and benefit our customers as much as possible, we managed to apply for brand protection in the Europe (mama mouth), North America (mama mouth). We manufacture and sell cases for tables and cell phones of a wide range of brands. Please search "mama mouth your tablet/mobile color" to take the fastest path to the product you want and have a clear view of other cases we offer in store. We adhere adequate pictures for each product. It is noted that all pictures we shot are taken under the most natural condition we can ever create to show you how the products actually look like. Please understand that even so, the color difference may still exist at the different image resolution of our computers and mobiles. 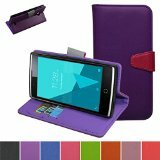 Alcatel One Touch Idol 3 (5.5 inch) Case,Mama Mouth [DETACHABLE ..
Alcatel Onetouch Pop Astro Case,Mama Mouth [Stand View] Folio Fl..
Looks good and does what the company claims. Happy with it and like the color. Alcatel One Touch Evolve 2 Case,Mama Mouth [Stand View] Folio Fl..
Love the color/patterns on these. Plus quality and place to put items.